Crock Pot Cheesy Salsa, Black Bean and Corn Dip – a delicious, cheesy dip that is full of flavor and can be made and kept warm in the slow cooker. Perfect for a game day get together. Football season is in full swing and my husband and I and our three kids love to get together with family and friends on game day. I grew up in a football loving family and I certainly enjoy watching the game. But, my favorite part about game day, as a kid and now, is spending time with family and friends and, of course, enjoying some delicious things to eat. 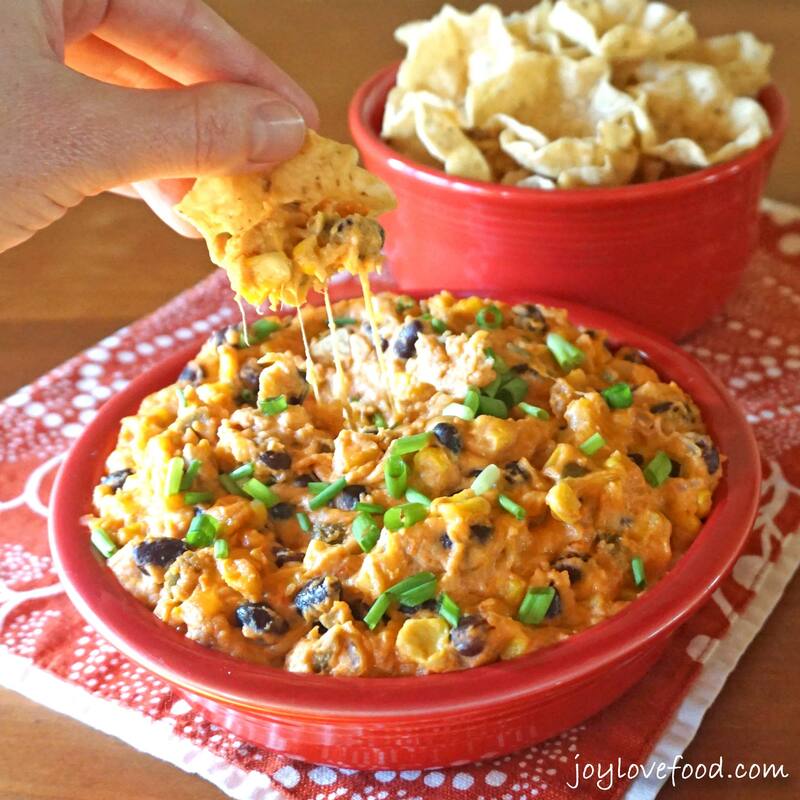 No game day get together is complete without a warm cheesy dip, such as my delicious Crock Pot Cheesy Salsa, Black Bean and Corn Dip. The Big Game is coming up. So, I headed over to my local Walmart to pick up supplies for our game day get together. Once I was in the store, I came across an in-store Game Day display filled with MARS and Wrigley candy. 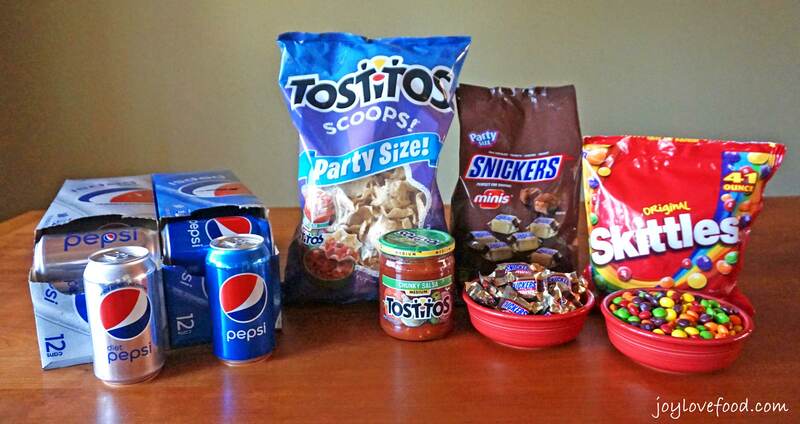 I picked up a 40oz bag of SNICKERS® Minis and a 41oz bag of Skittles® which are the perfect sizes for a party. In the Chips aisle at Walmart, I picked up a jar of TOSTITOS® Medium Chunky Salsa to make my Crock Pot Cheesy Salsa, Black Bean and Corn Dip and a bag of TOSTITOS® Scoops Party Size for dipping. In the Soft Drinks aisle, I picked up 12 packs of Pepsi™ and Diet Pepsi™ 12 oz cans. Back at home, with my chips, salsa, soft drinks and candy, I had all the fixings for a great game day get together. Speaking of great game day get togethers, check out the super cool snack stadiums below, there are so many great ideas. 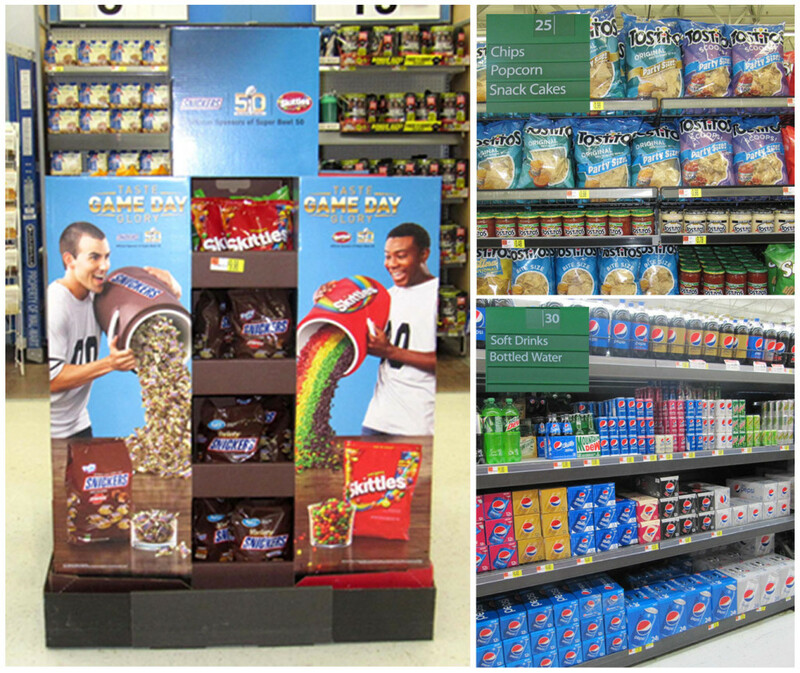 You can vote for your favorite snack stadium to enter the #gamedayglorysweepstakes for a chance to win a $100 Walmart eGift card or Xbox One! 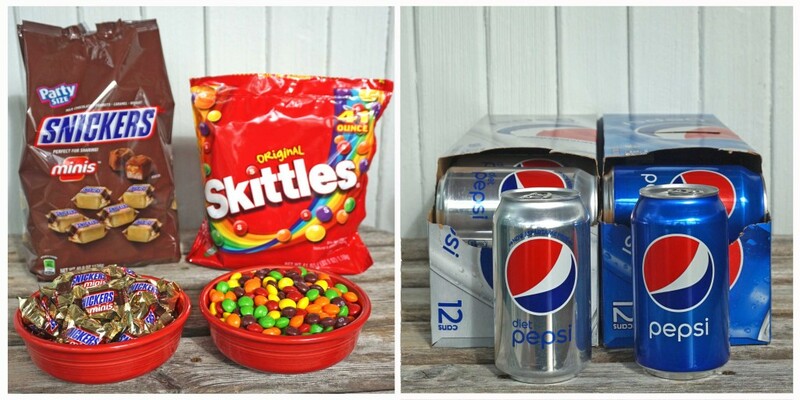 Aren’t these snack stadiums amazing? For another chance to win the sweepstakes, you can share a photo of your own snack stadium on Instagram and be sure to use the tag “#gamedayglorysweepstakes”. Ok, back to my delicious Crock Pot Cheesy Salsa, Black Bean and Corn Dip. 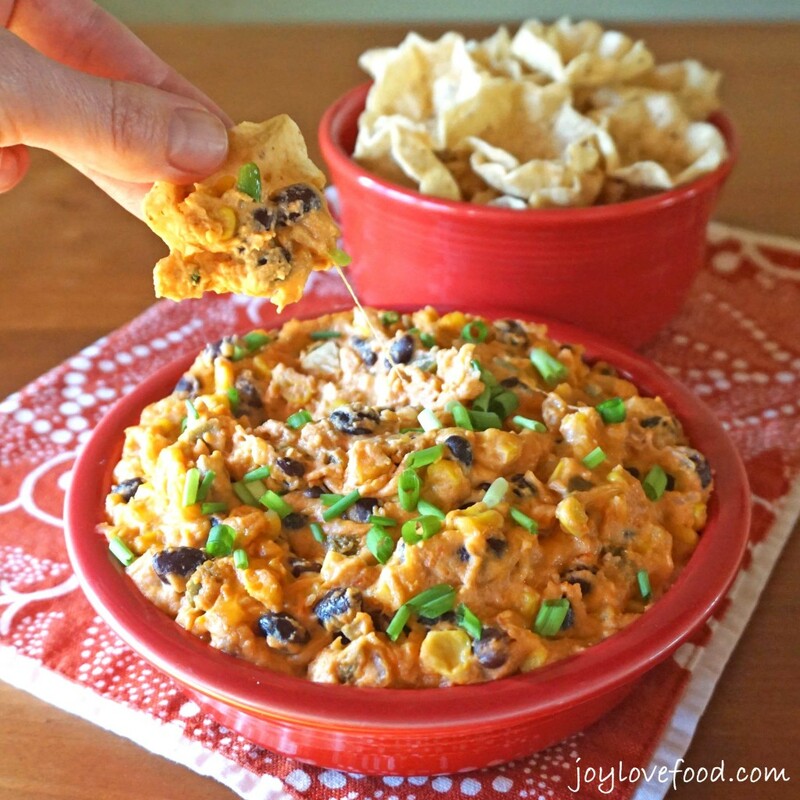 I love making dips in my slow cooker for parties and game day get togethers. I like that all the prep work can be done before hand and the dip stays warm in the slow cooker. That way, I’m not stuck in the kitchen and can enjoy watching the game and spending time with family and friends. 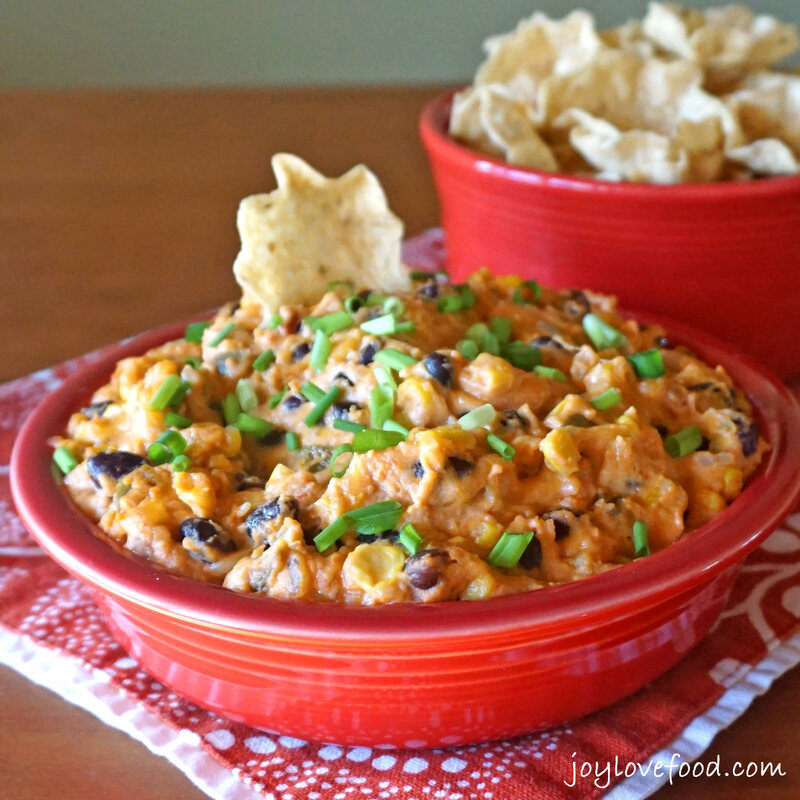 This Crock Pot Cheesy Salsa, Black Bean and Corn Dip and is so easy to prepare. And, it only requires six ingredients including a jar of TOSTITOS® Medium Chunky Salsa, corn, black beans, cream cheese, sour cream and shredded Monterey Jack and Cheddar cheeses. First, put the salsa, corn, black beans, sour cream and cream cheese in the slow cooker and give it a good stir to combine. Next, cover the slow cooker and cook the mixture on high for about an hour or so until it is heated through and starts to bubble. Then, add the shredded cheese and stir until the cheese melts. Once the cheese is melted, turn the heat down to low or warm. And that’s it, your Crock Pot Cheesy Salsa, Black Bean and Corn Dip is ready. You can dip your chips right into the slow cooker if you like. This delicious Crock Pot Cheesy Salsa, Black Bean and Corn Dip will stay nice and warm in the slow cooker throughout the game. Guests can help themselves straight from the slow cooker. Or, as I like to do, you can scoop a portion of this Crock Pot Cheesy Salsa, Black Bean and Corn Dip into a serving bowl and top with a sprinkling of green onions. I then replenish the serving bowl with warm dip from the slow cooker as needed. I also like to set out little bowls filled with sweet treats such as SNICKERS® Minis and Skittles® for snacking on throughout our game day get togethers. Some nice cold cans of Pepsi™ and Diet Pepsi™ are great game day drinks. 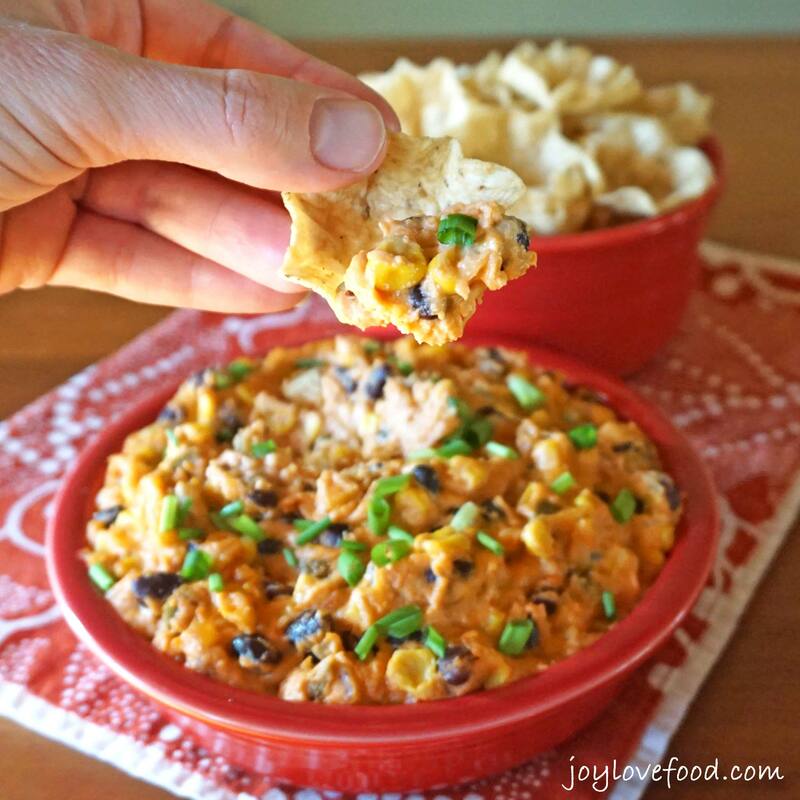 TOSTITOS® Scoops are the perfect accompaniment to this Crock Pot Cheesy Salsa, Black Bean and Corn Dip. They have the ideal shape for scooping up this creamy, chunky, flavorful dip. This delicious Crock Pot Cheesy Salsa, Black Bean and Corn Dip is so easy to make and keeps warm in the slow cooker, perfect for a game day get together or party anytime. What is your favorite game day dip? Please let me know in the comments below! Looking for even more game day ideas? Check out all the great recipes and snack stadiums here. Crock Pot Cheesy Salsa, Black Bean and Corn Dip - a delicious, cheesy dip that is full of flavor and can be made and kept warm in the slow cooker, perfect for a game day get together. Add salsa, corn, black beans, cream cheese and sour cream to slow cooker (see Notes) and stir to combine. 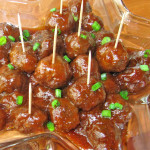 Cover slow cooker and cook on High heat until mixture is heated through and starts to bubble, about 1 – 1 ½ hours. Remove lid and add shredded cheese, stir until cheese is melted. Serve immediately, top with sliced green onions, if desired. Or, keep dip warm in the slow cooker, on either the Low or Warm setting. Serve dip with TOSTITOS® Scoops. 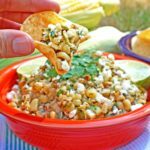 I use my 6-quart slow cooker to prepare this dip, however you can use any size slow cooker that will hold about 2 quarts and adjust the cooking time accordingly. 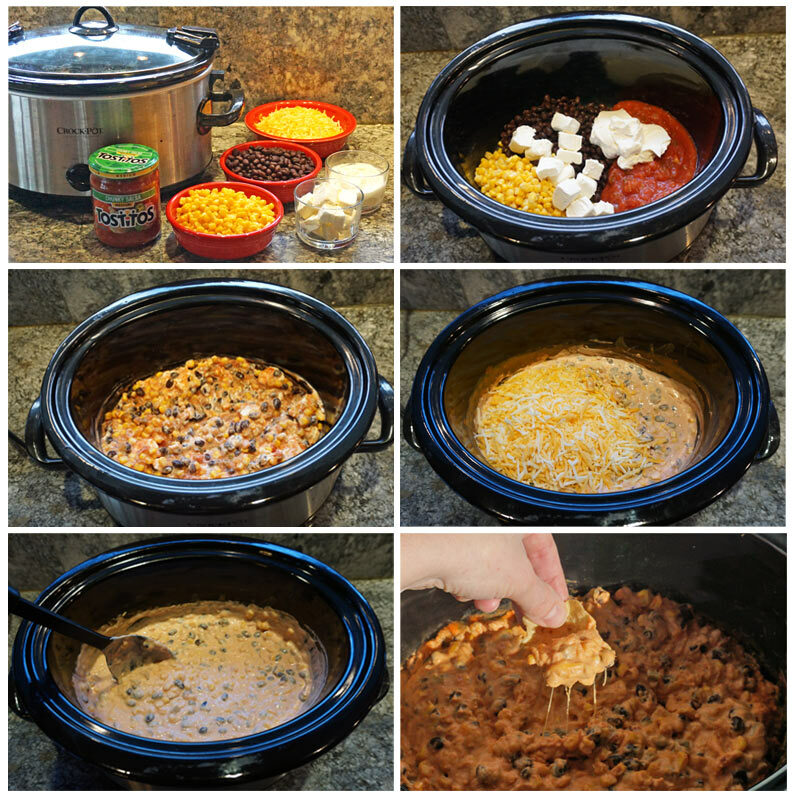 This entry was posted in Appetizers & Small Bites, Crock Pot / Slow Cooker, Dips & Spreads, Main Dishes and tagged appetizer, big game, black beans, cheddar, cheese, cheesy, corn, crock pot, crockpot, dip, easy, fall, game day, hot, Monterey Jack, party, recipe, salsa, slow cooker, winter. Quite simple but perfect for a quick snack. I am trying this out soon. Thanks Mitanti, it is really quick and easy and so delicious too! Hope you enjoy! Is this two cups total of the cheddar and Monterey Jack or two cups each? On the Crock Pot Cheesy Salsa, Black Bean and Corn dip that is? Hi Alyssa, it is 2 cups total of shredded cheese. I used an 8 oz bag of a blend of Monterey Jack and Cheddar cheeses. A Mexican cheese blend would work too. I’ve updated the recipe to make that clear. Thanks so much for visiting and commenting, I hope you give the recipe a try and enjoy! Hi Joy! 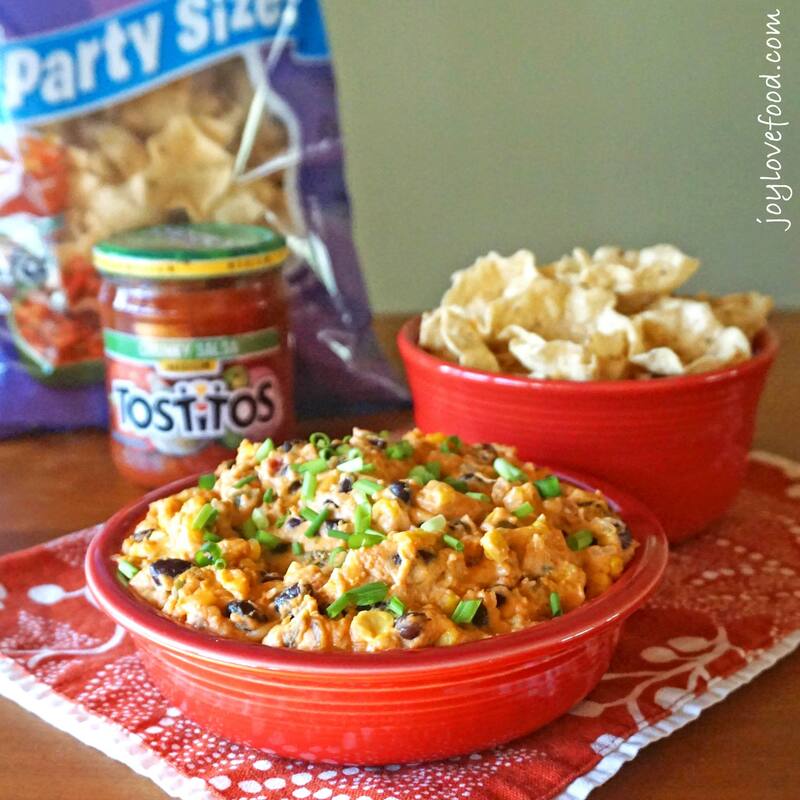 This yummy dip was the most viewed from our party last week and will be a feature this week! I can see why! It’s amazing! Thanks for sharing on My 2 Favorite Things on Thursday…Hope to see you again tomorrow!! Pinned! Crockpot recipes like these are so much fun, you can just put them in there and stop worrying about atleast one thing! They look so creamy and delicious! Oh Boy!! I wish I would have had this dip yesterday! Dips are so great for entertaining and it seems like our kids and grandkids are really fond of them — they magically disappear the minute I set them out. Thank you for a great recipe. 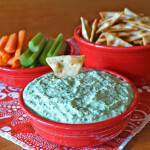 Dips are so perfect for entertaining…and I am always looking for new ones to try. Thanks. What a great dip! Thank you so much for sharing with us for our 5th Anniversary of Full Plate Thursday! Hope you have a fantastic week and hope to see you again real soon! That is SO cheesy. This looks great! I love crock pot party recipes. It takes so much stress off of my shoulders! I NEED this in my belly now! Love dips with a just a few ingredients and that it can be made in the slow cooker. Making in the slow cooker makes it easy to transport to parties to keep warm. It’s just morning here, but if I could I’d grab the whole dish via the screen. It looks sooooooooo DELICIOUS !! I seriously need to get a crock pot. Like yesterday, this will be on my to do list for sure! Dips are such great party food. I must learn to make it! Oooh this appeals to the cheese fiend in me! I like that it’s made in the crock pot to so I can just set and forget. This looks lovely. I’m always looking for yummy vegetarian meals as my daughter won’t eat meat. What an indulging dip! I could devour it in moments! Was fun to enter. Those stadiums are pretty spiffy. Your dip looks way delicious too! Such a great and easy recipe! i’ll be making this for the superbowl tomorrow. I love using my crockpot, especially for parties! This dip looks amazing! This dip just looks amazing. It is on my “to do” list to try. My crock would be in heaven! Wow I can see why people would love this dip for Super Bowl. That looks like a delicious dip! And I love that it can be put together in the crockpot. Saves time and dishes!! What a yummy dip! I could definitely go for that on game day! I haven’t figured out all of what I am making yet…I may be adding this one to the menu…I need easy this year! That looks yummy. I love using the crock pot for big gatherings. I love crock pot dips! Perfect for hosting, because you aren’t stuck in the kitchen cooking, you can enjoy the party with everyone else! Sounds like a tasty dip. That stadium is too cute! Joy–this is SO on our menu for Sunday. Pinned! Yum! What a delicious looking dip. I know I would have a hard time staying out of it! I could make a meal out if this dip! That sounds delicious! Thanks Analida, it is really good! I love crock pot recipes for the Super Bowl. This looks so super cheesy and delicious! I bet it would be great with pita chips, too. Thanks Lucy, this would indeed be delicious with pita chips, great idea! I think I could eat this with a spoon! Yum. Love those snack stadiums….people are so creative. Thanks Denise, I so agree, those snack stadiums are amazing! 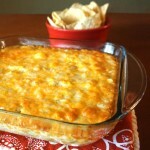 Not a Football fan, but definitely a fan of this cheese back bean dip! OMG, I wish I could scoop some of that Dip right now, it looks so yum! And great idea of making it in a crockpot. Thanks Molly, it really is so good and easy to make too! I love bean and corn dips so much!! I could make a meal out of them! Love that this is done in the crockpot too..so easy! Thanks Jenn, it really is so easy and absolutely delicious!